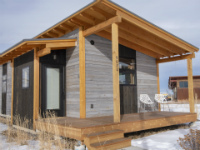 Our fully equipped vacation rental homes, cabins, condos are perfect for your getaway to Teton Valley whether you're looking to visit Grand Targhee, Grand Teton National Park, Yellowstone National Park, Jackson, Driggs or Victor. 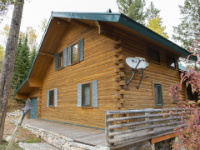 Choose from a small romantic cabin to a lodge large enough for family reunions or business gatherings. All of our vacation rentals include linens, towels and well equipped kitchens. Click on the picture for a full description, rates and more photos of each rental, or check availability directly below. All properties can be booked directly through our office to avoid the additional VRBO fees. Beautiful timber frame home with 360 degree mountain views! This unique home on the west side of the valley features a frame that was made from beams salvaged from a sawmill in Washington State. Large deck faces Teton range, private outdoor hot tub with amazing views. 3 bedrooms plus sleeping options in loft and finished basement. 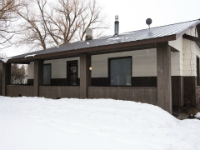 Log cabin built in 1996 with 2 Master Bedrooms, open loft space with alcove bedrooms. Teton and Big Hole Mountain Range Views. Open floor plan for cozy family vacation. This log cabin provides a quiet mountain getaway for a group up to 10. Large east facing picture windows give guests breathtaking views of the magical Teton range. Fully equipped kitchen, open floor plan, 2 bedrooms with full baths. Loft has central common area with a queen futon. North and South of the central loft there are spacious alcoves that have privacy partitions and overlook the cabin. Second floor condo at Buffalo Valley is just 2 miles north of Downtown Driggs - making this an excellent year-round vacation spot. This a newer, high end condo with granite counter tops, rich wood cabinets and accents, tile & carpet flooring, and a private balcony. North facing windows provide great valley views. 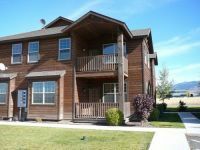 Great town home off Ski Hill Road with easy access to trails, on the way to Targhee, and just barely north of Driggs. Can be rented along with neighboring unit Shadow Brook 2 for larger parties of up to 14! Fireplace, wireless, patio and yard with a BBQ and furniture. Spacious single story 1980 sq ft home with detached garage. Open floor plan with cozy furniture and unique decor. Large family room with wood floors, vaulted ceiling and wood stove, plus has a additional 400 sq ft play room for dance parties. Master bath has jetted tub. 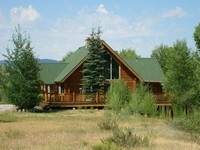 Situated on 2.8 acres at the end of a cul-de-sac, with mature landscaping and views of the Tetons and Big Holes. 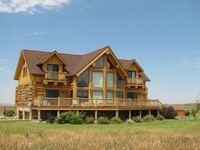 Great for your family vacation in the Tetons! Secluded 3 story log home on 4.5 wooded acres. A large wrap around deck provide additional outdoor usable space, and a home theater room with over sized leather chairs make this home a perfect retreat. 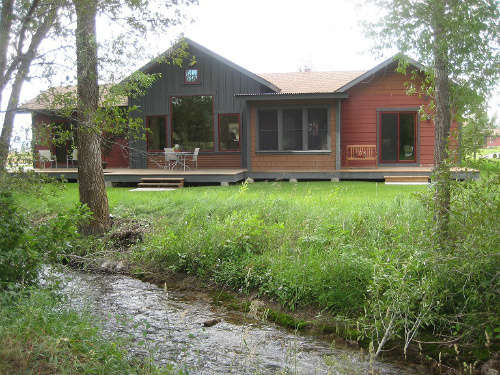 Located between Driggs and Victor - this is a great location for year-round activities. This gorgeous log cabin overflows with high end and natural wood finishes and will provide a family retreat like no other in Teton Valley. Loaded with entertainment for kids of all ages, lots of open space, privacy and views. Upon entering this house, you'll be overwhelmed by the warmth the owners have designed to accommodate their children and now grandchildren in this western retreat. Families and groups will enjoy the four private bedrooms, all featuring king size beds. 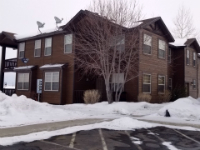 This well built two story townhouse is located right in Driggs! Private driveway and fully-fenced yard along with the double insulated walls give the feel of a standalone house. This in-town locations is great for exploring the dining and shopping of downtown Driggs, and is a short drive from Grand Targhee. Contemporary home located just north of Victor, Idaho. 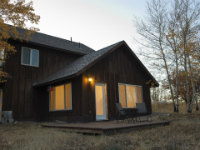 This home is situated on 20 beautiful acres in a natural riparian area with abundant wildlife. A stream runs through the property. Architectural design and finish materials punctuate this stunning home that features a chef’s kitchen and birch wood cabinetry. Mountain views abound from every aspect of the home and surrounding land. Special attention has been paid to invite the outdoors into the home with floor to ceiling windows. The open floor plan of the house has the kitchen, dining room and living room on the ground level. The master bedroom, also on the ground level, has a king bed and private master ¾ bath. There are two bedrooms upstairs, one with a king bed and one with a queen bed; they share a full bath. There is a nice sitting area off the two upstairs bedrooms. A propane burning stove in the center of the living area adds to the ambiance on a crisp winters night. Bring your horses! Horse lovers will cherish the outbuildings and riding facilities, including a unique black sand riding corral. Great town home off Ski Hill Road with easy access to trails, on the way to Targhee, and just barely north of Driggs. Can be rented along with neighboring unit Casa Budde for larger parties of up to 14! Fireplace, wireless, patio and yard with a BBQ and furniture. 2 story end unit townhouse completely equipped for your vacation use! Only a mile east of Driggs just off Ski Hill Rd, this quiet location is central to exploring the valley as well as the downtown dining and shopping. 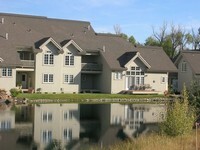 Relax in the summer evening on the west deck overlooking the pond that is centrally located in the complex. Located just 8 miles from Grand Targhee you can unwind after skiing, biking, hiking or whatever you choose to be your adventure! Each bedroom suite has a private bathroom. Both bedrooms have queen beds and there is also a queen sleeper sofa in living room. The beautiful fully equipped kitchen has stainless steel appliances including microwave and dishwasher, toaster, and coffee pot. A cozy living room with slate tile propane fireplace and large picture windows facing a stream and open space is inviting and relaxing. 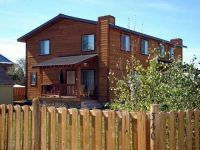 Ground floor condo at Teton Creek Resort, which has 2 community hot tubs and is just 9 miles from Grand Targhee! This property is well appointed with custom photographs and art from the owner's travels. Targhee shuttle picks up from this location to make your ski days even more relaxing! 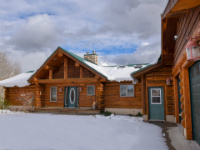 Ground floor condo at Teton Creek Resort, which has 2 community hot tubs and is just 9 miles from Grand Targhee! This property has log and wood furniture and higher end decor throughout. Targhee shuttle picks up from this location to make your ski days even more relaxing! Ground floor condo at Teton Creek Resort, which has 2 community hot tubs and is just 9 miles from Grand Targhee! Targhee shuttle picks up from this location to make your ski days even more relaxing! Enjoy a complimentary bottle of wine as the owner's gift to you. This charming home on a quiet street in downtown Driggs is walking distance to local shops and restaurants. The manicured, partially fenced yard also has a beautiful deck with views of the Tetons. On the main floor is the living room, kitchen, master bedroom with a full size bed, full bathroom and laundry area. Located on the second floor are 2 bedrooms and a full bathroom. One bedroom has 2 twin beds and the other has 1 twin. This well built, mostly remodeled house is perfect for that get away. All new kitchen appliances and washer and dryer on site. Sleeps 5 - a queen bed in one bedroom, two twin beds in the second bedroom and a pull out couch. Down comforters to snuggle under during the winter months. Nice entry area to store skis or summer activity gear. 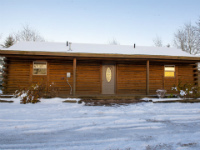 Located right on Ski Hill Road, in a quiet neighborhood, just a block from downtown Driggs, it is within walking distance to all the town's amenities. Rustic and private 2 story cabin with board and batten exterior, on 10 acres with incredible Teton views, including the Grand Teton. This is a perfect getaway if you're looking to embrace the outdoor spirit of the valley, with cross country skiing right out the door and private roadways for walking in the summer. Only 7 miles north of Driggs, there's still quick and easy access to great dining and downtown shopping. 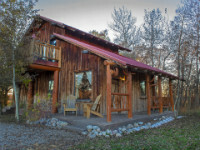 This quiet getaway in Victor provides excellent access to Targhee, Jackson, Yellowstone & Grand Teton National Parks. A very comfortable alternative to staying in a motel suite! Enjoy the great dining in Victor and Driggs, and enjoy the splendorous views of the nearby Grand Teton mountain range. Commutes are easy in every direction - use this as a landing spot for your ski vacations and a great stopping point for your National Park tours. 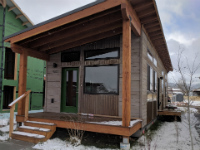 Midway between Driggs, ID & Jackson, WY, this 1 bedroom house is a budget friendly lodging option for 2 adults.